For over 38 years, Mary Jane Scott has utilized her customized NCLEX curriculum to achieve a passing rate of 95% with her students. She has taught her NCLEX strategies at some of the most prestigious Nursing programs in the country including Boston College and the MGH Institute of Health Professions. Schedule a session today and you will be one step closer to fulfilling your dream as a Registered Nurse! Give yourself a pay raise. How? Invest in your future NOW by hiring a private NCLEX tutor who is an expert in her field. Have you taken the NCLEX and are afraid to admit you did not pass? You are not ALONE. It's time to take the next step and hire a private Nursing Boards Specialist who has successfully tutored over 700 students with a 95% NCLEX pass rate. Learn the strategies that Mary Jane has shared with students at 3 of the most prestigious colleges in the Boston area. 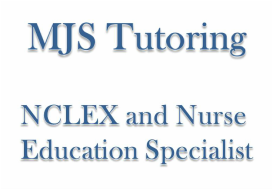 After completing the comprehensive MJS Tutoring program, you will finally pass the NCLEX and be able to put the initials R.N. after your name. Have a question regarding MJS Tutoring? MJS Tutoring is based out of North Reading, MA. The office is located just minutes from I-95 and I-93.